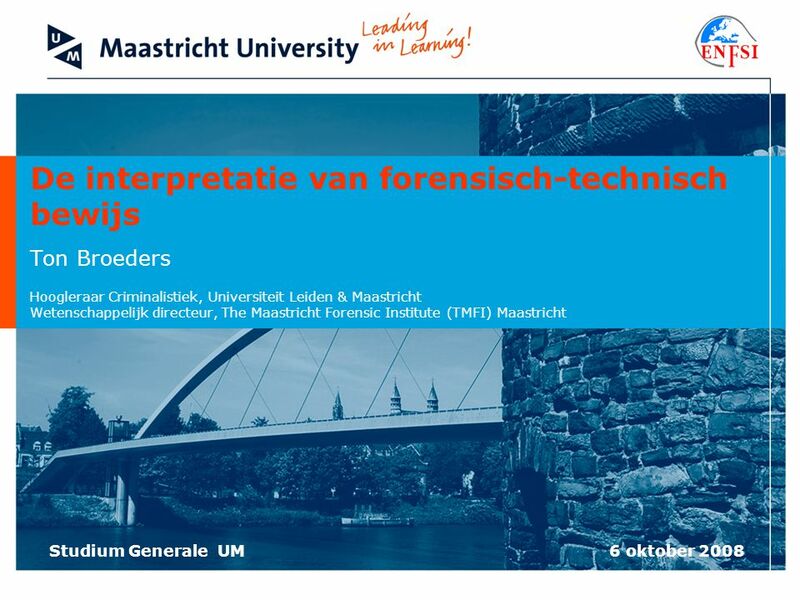 Studium Generale UM 6 oktober 2008 De interpretatie van forensisch-technisch bewijs Ton Broeders Hoogleraar Criminalistiek, Universiteit Leiden & Maastricht. 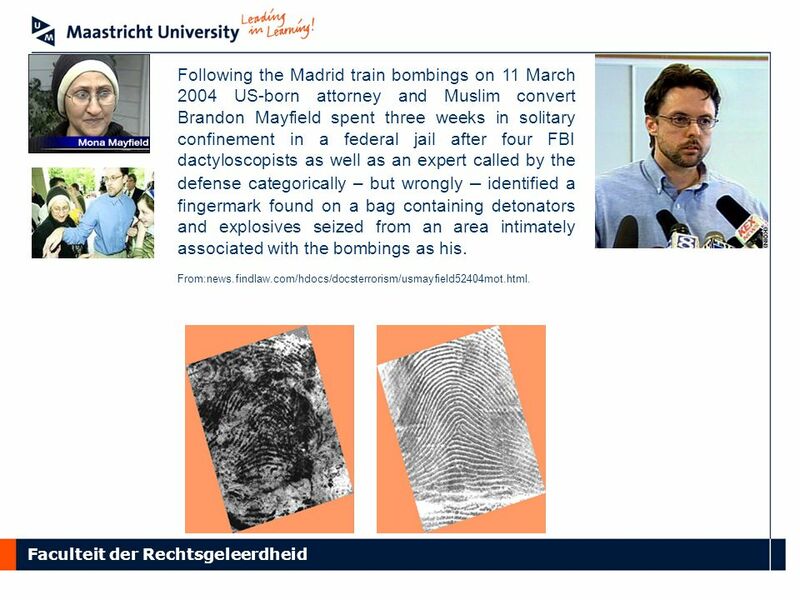 2 Faculteit der Rechtsgeleerdheid Following the Madrid train bombings on 11 March 2004 US-born attorney and Muslim convert Brandon Mayfield spent three weeks in solitary confinement in a federal jail after four FBI dactyloscopists as well as an expert called by the defense categorically – but wrongly – identified a fingermark found on a bag containing detonators and explosives seized from an area intimately associated with the bombings as his. 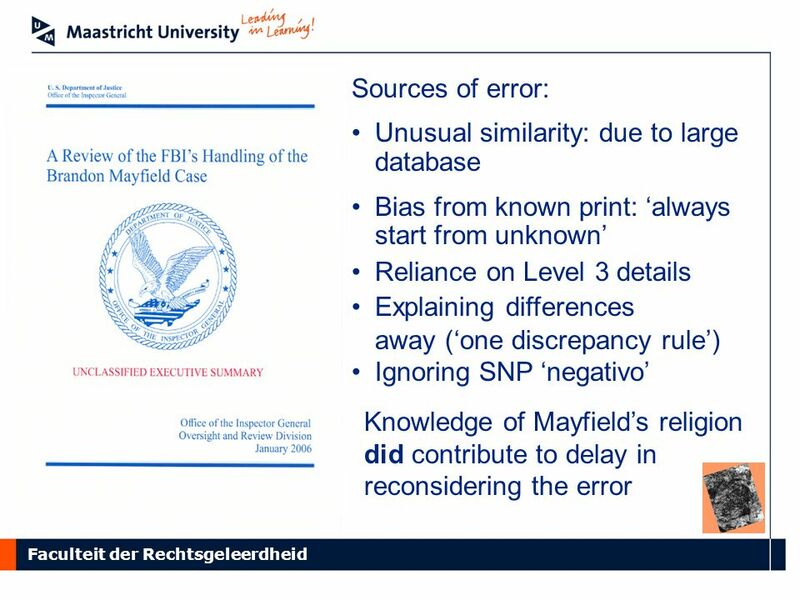 From:news.findlaw.com/hdocs/docsterrorism/usmayfield52404mot.html. 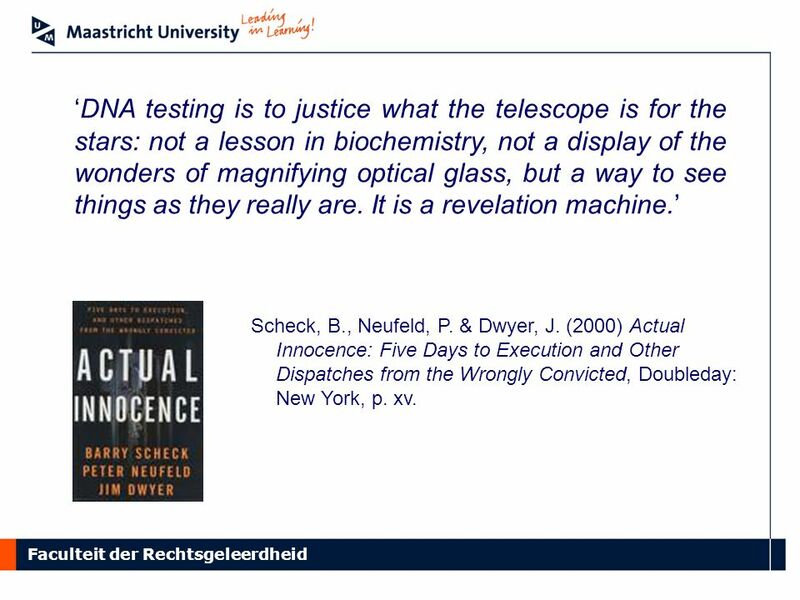 9 ‘DNA testing is to justice what the telescope is for the stars: not a lesson in biochemistry, not a display of the wonders of magnifying optical glass, but a way to see things as they really are. It is a revelation machine.’ Scheck, B., Neufeld, P. & Dwyer, J. 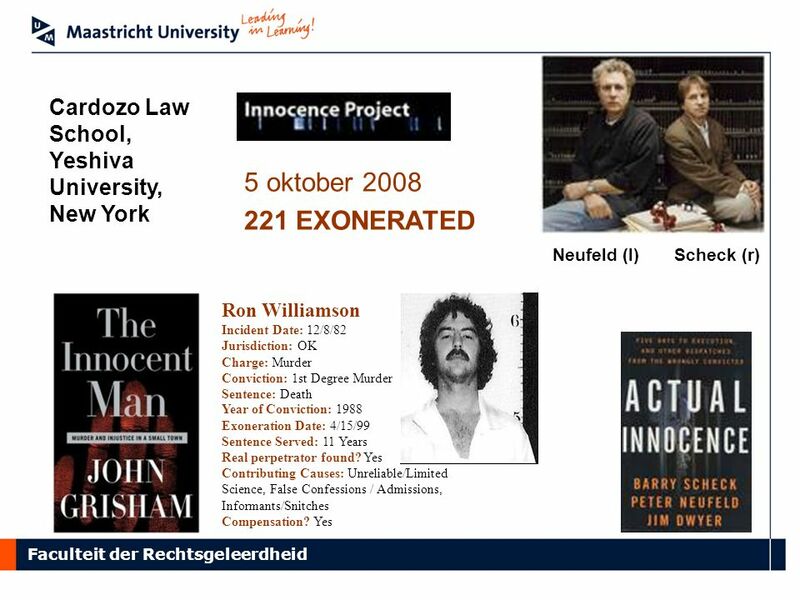 (2000) Actual Innocence: Five Days to Execution and Other Dispatches from the Wrongly Convicted, Doubleday: New York, p. xv. 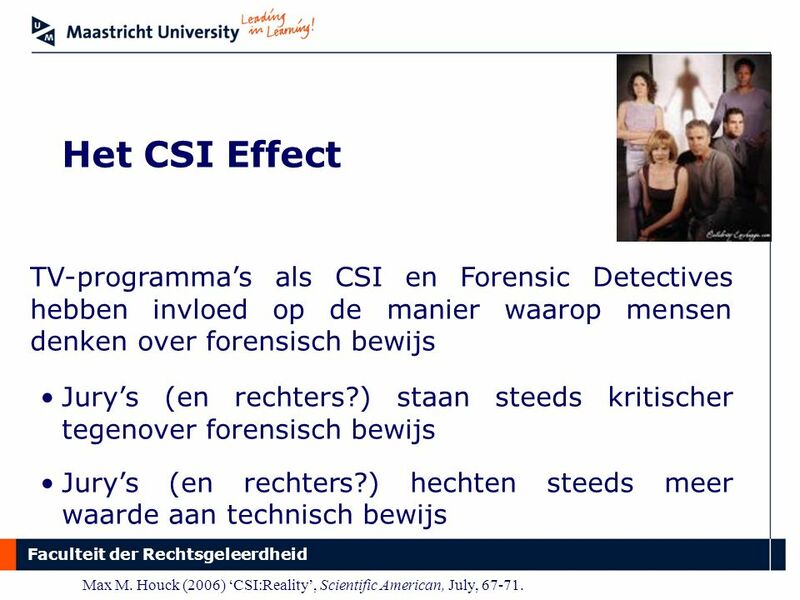 11 Faculteit der Rechtsgeleerdheid Het CSI Effect TV-programma’s als CSI en Forensic Detectives hebben invloed op de manier waarop mensen denken over forensisch bewijs Jury’s (en rechters?) 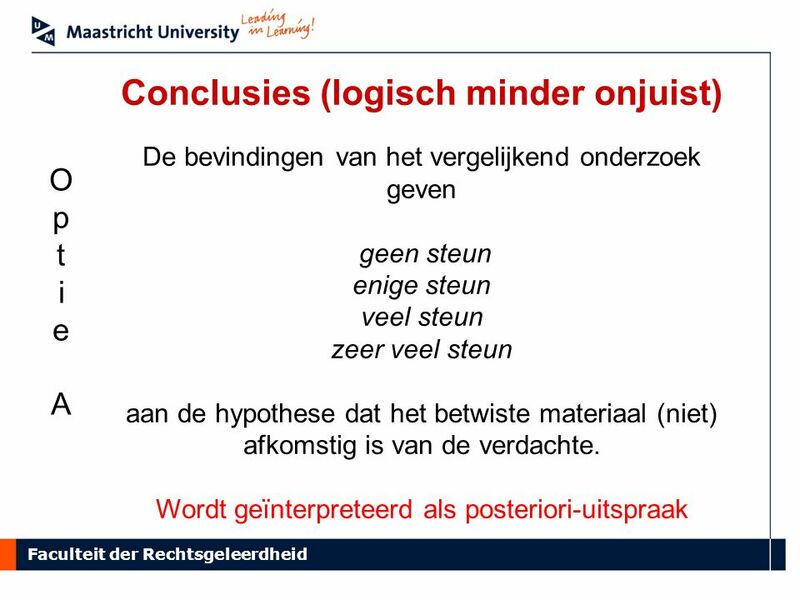 staan steeds kritischer tegenover forensisch bewijs Jury’s (en rechters?) 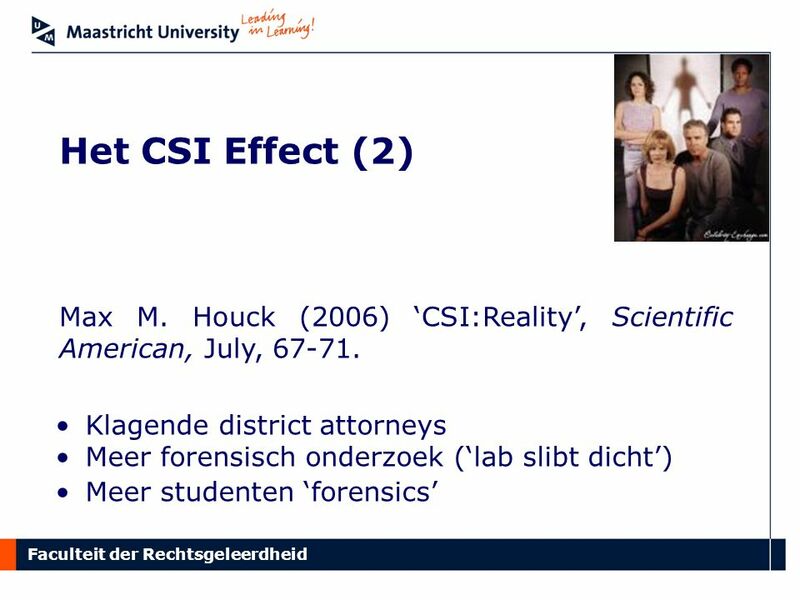 hechten steeds meer waarde aan technisch bewijs Max M. Houck (2006) ‘CSI:Reality’, Scientific American, July, 67-71. 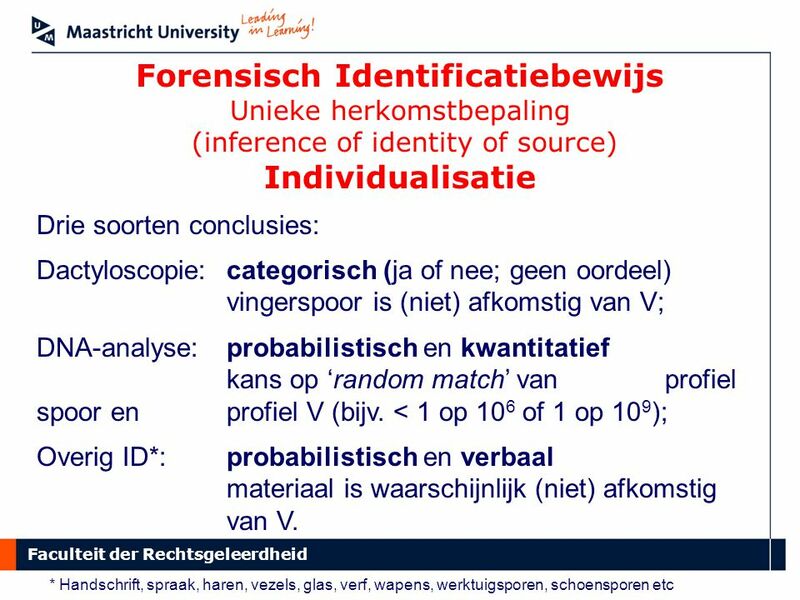 15 Faculteit der Rechtsgeleerdheid Problemen bij de waardering van forensisch bewijs 1.Putten (NL): Matchende schaamhaar ‘keihard daderbewijs’; sleepspoor ter neutralisering niet- matchend sperma op dij slachtoffer. 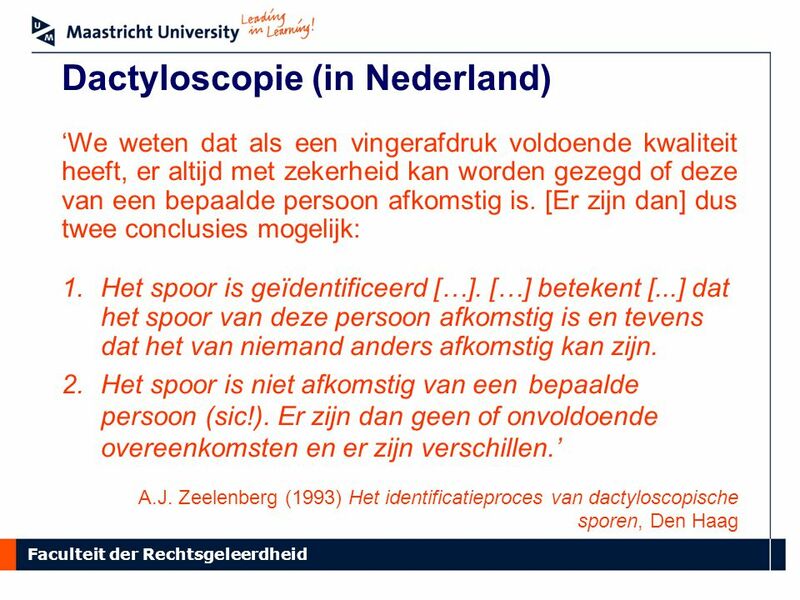 2.Deventer (NL): Geuridentificatieproef associeert verdachte met mes en met misdrijf. 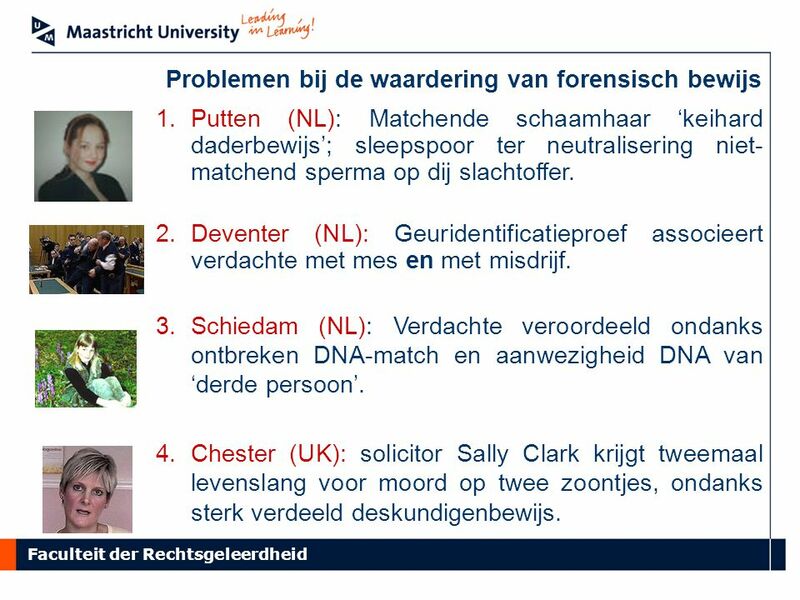 3.Schiedam (NL): Verdachte veroordeeld ondanks ontbreken DNA-match en aanwezigheid DNA van ‘derde persoon’. 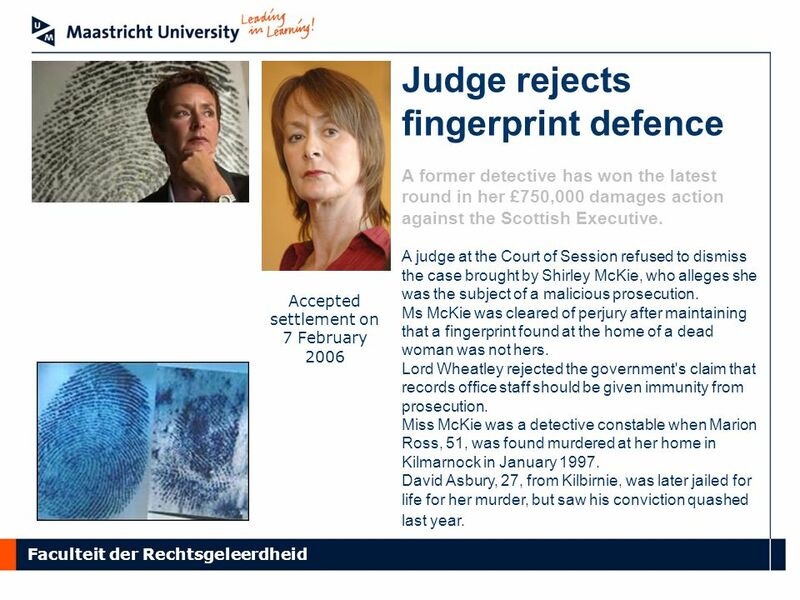 4.Chester (UK): solicitor Sally Clark krijgt tweemaal levenslang voor moord op twee zoontjes, ondanks sterk verdeeld deskundigenbewijs. 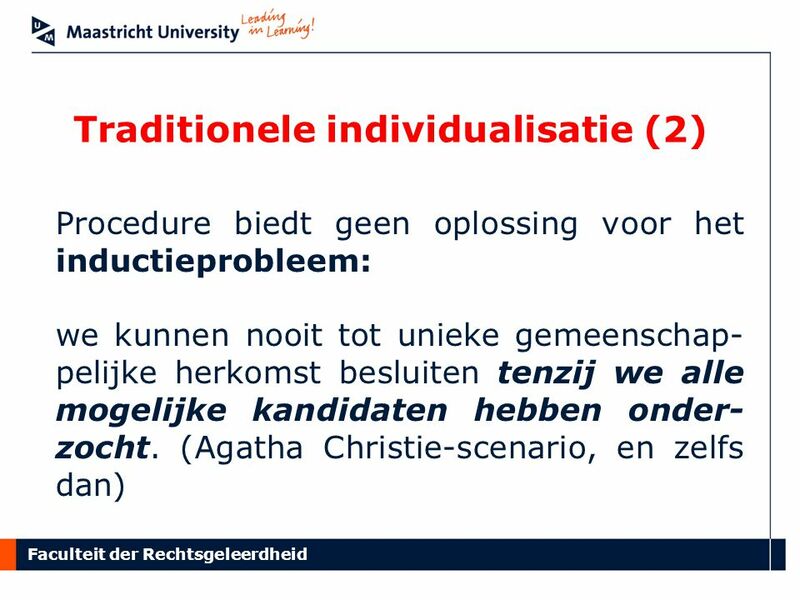 16 Faculteit der Rechtsgeleerdheid Hierarchy of propositions (Evett et al.) 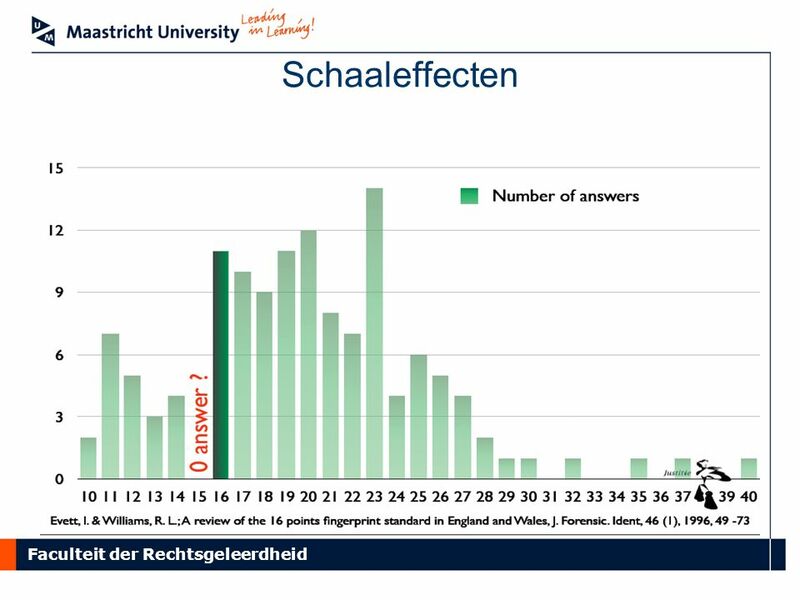 SourceHerkomst ActivityActiviteit OffenceDelict 1.Wat is de bron van het spoor (wond, huls, vezel, schrift, vingerspoor, DNA)? 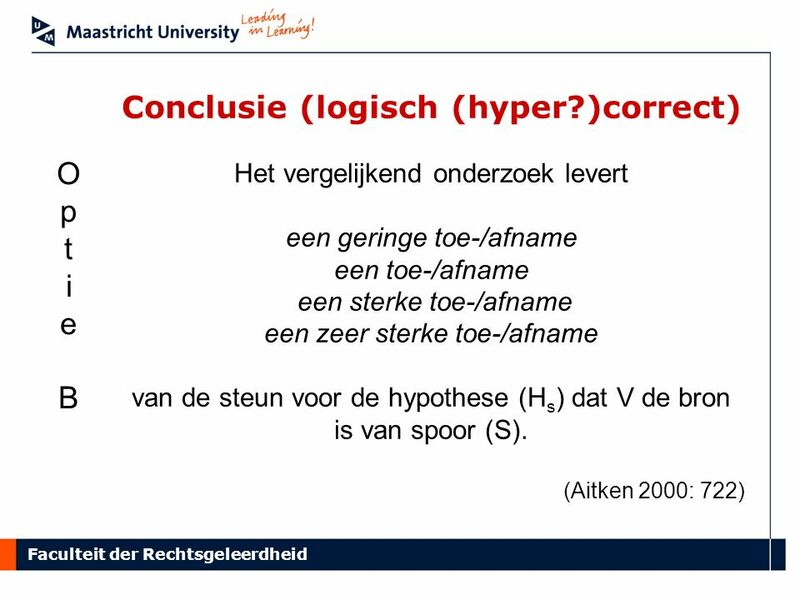 2.Hoe is het spoor ontstaan? 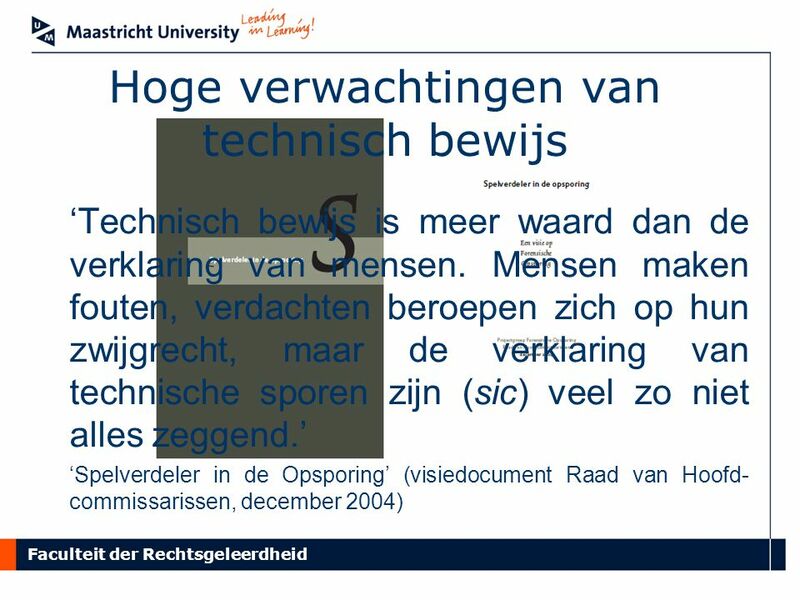 3.Is er sprake van een delict? 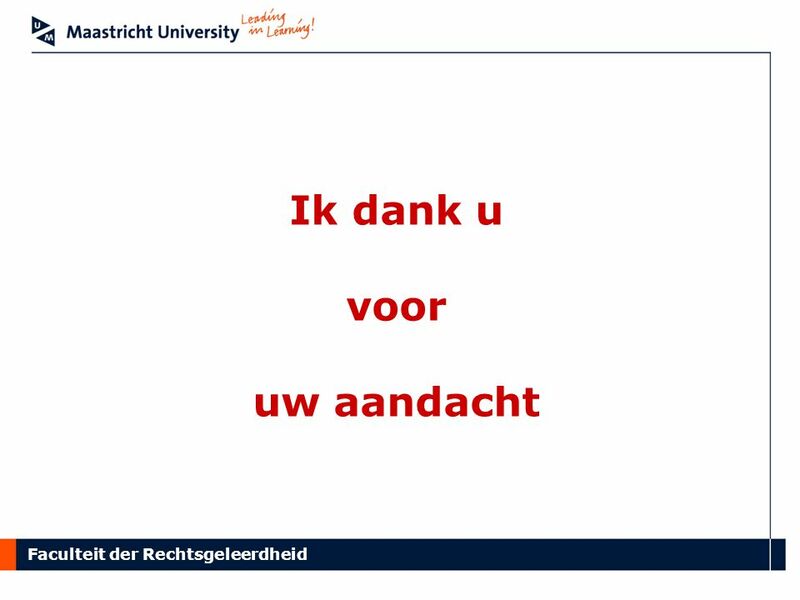 4.Is de verdachte de dader? 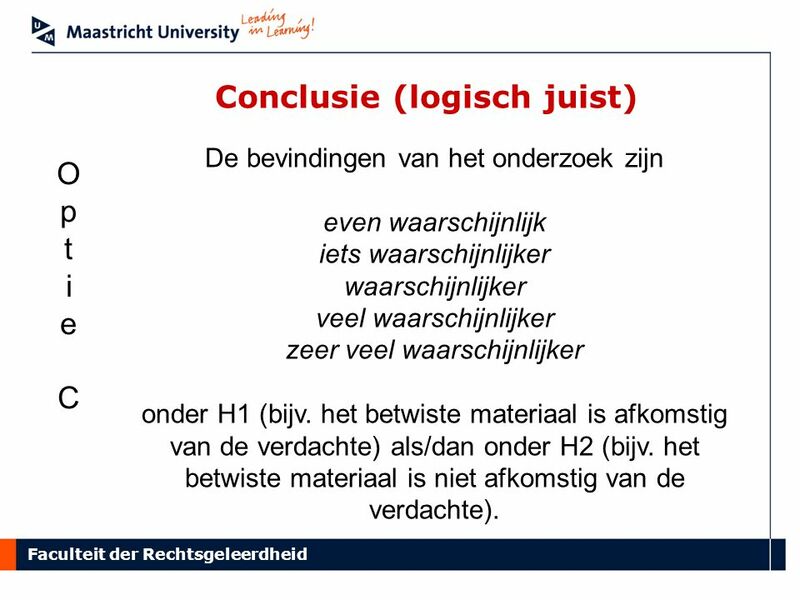 5.Is de dader schuldig; is de dader strafbaar, etc.? 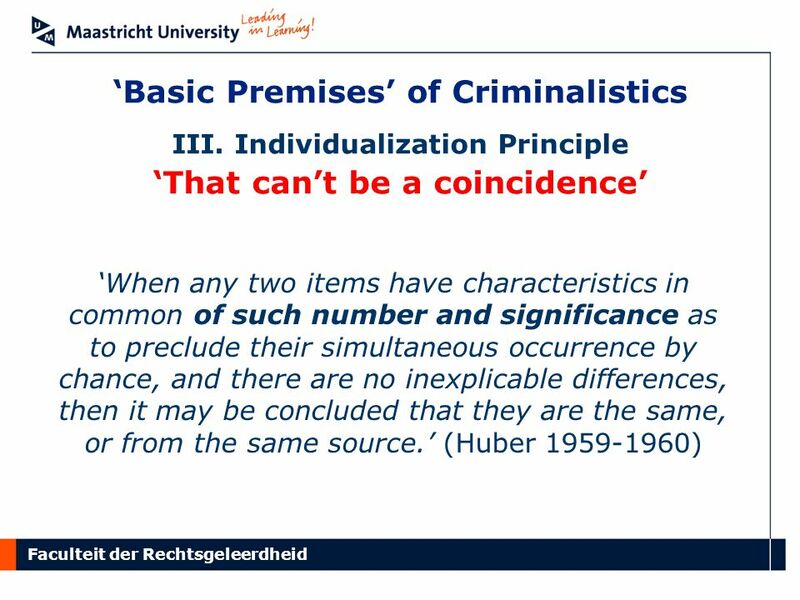 18 Faculteit der Rechtsgeleerdheid ‘Basic Premises’ of Criminalistics Inference of identity of source I. 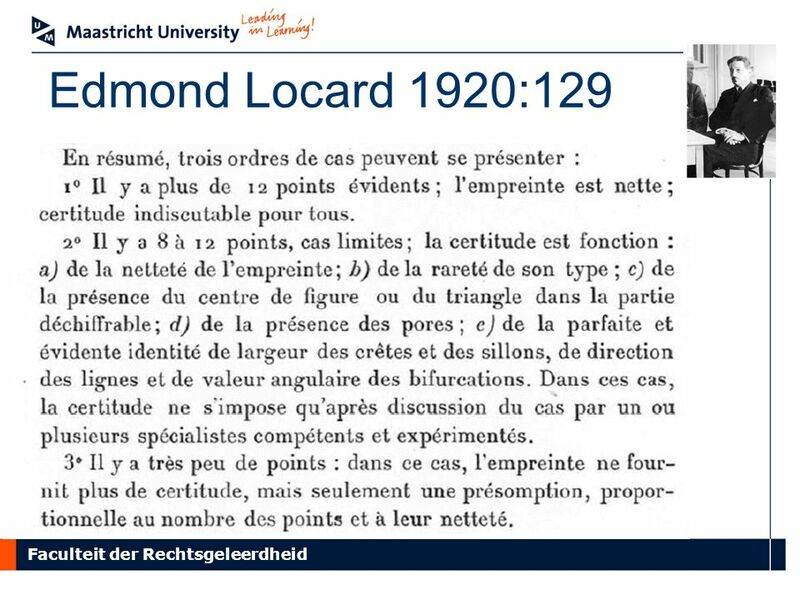 Transfer Principle ‘Every contact leaves a trace’ Locard’s Exchange Principle; Transfer Principle ‘…nul ne peut agir avec l'intensité que suppose l'action criminelle sans laisser des marques multiples dans son passage; […] tantôt le malfaiteur a laissé sur les lieux des marques de son activité, tantôt par une action inverse, il a emporté sur son corps ou sur ses vêtements les indices de son séjour ou de son geste.’ (E. Locard 1923). II. 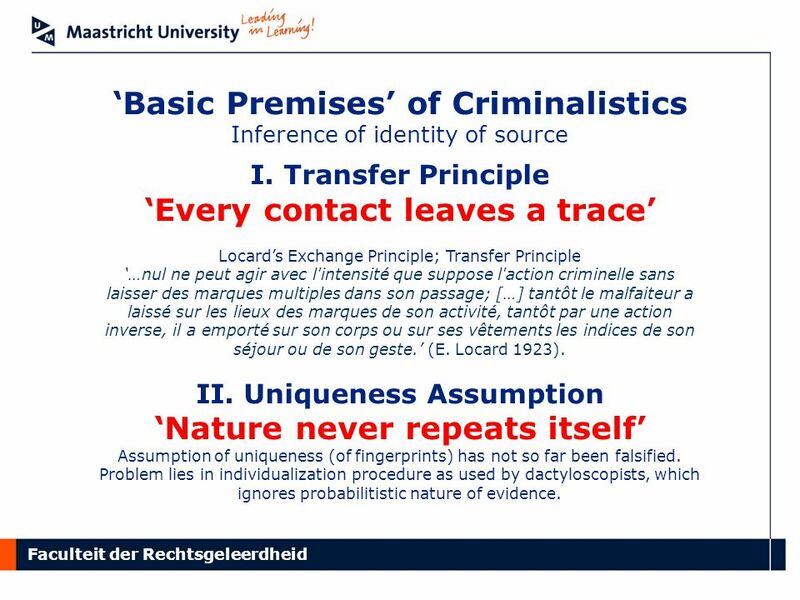 Uniqueness Assumption ‘Nature never repeats itself’ Assumption of uniqueness (of fingerprints) has not so far been falsified. 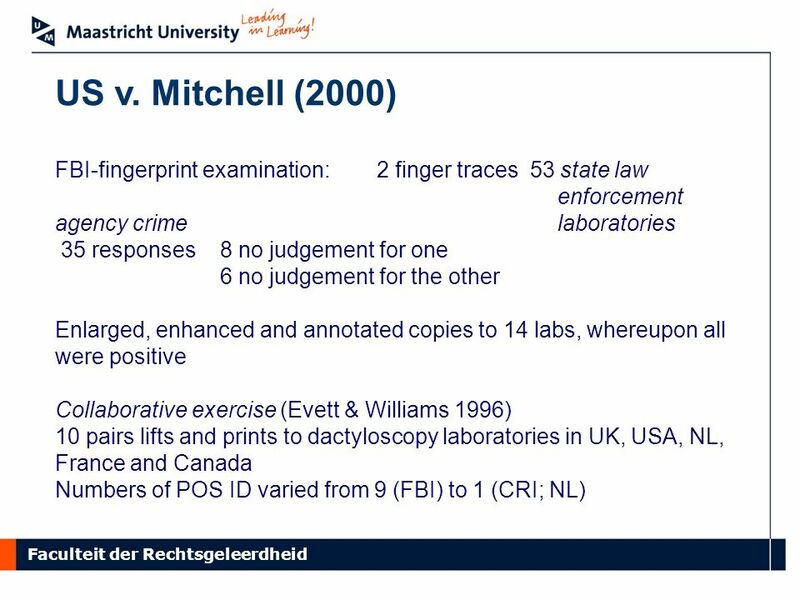 Problem lies in individualization procedure as used by dactyloscopists, which ignores probabilitistic nature of evidence. 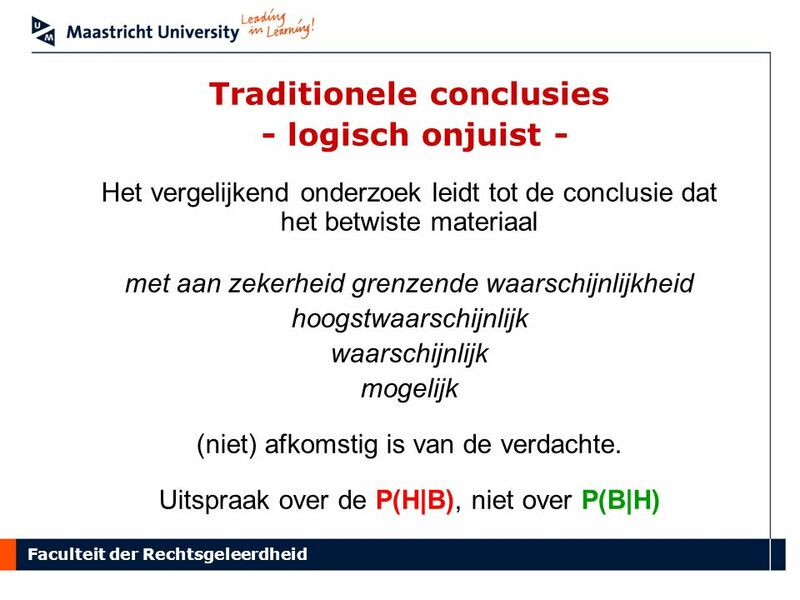 23 Faculteit der Rechtsgeleerdheid Transposed Conditional Statement of probability of findings (evidence) given a hypothesis, P(E|H), ≠ Statement of probability of hypothesis given the findings (evidence), P(H|E). If we are in Ireland, the conclusion may well be correct. 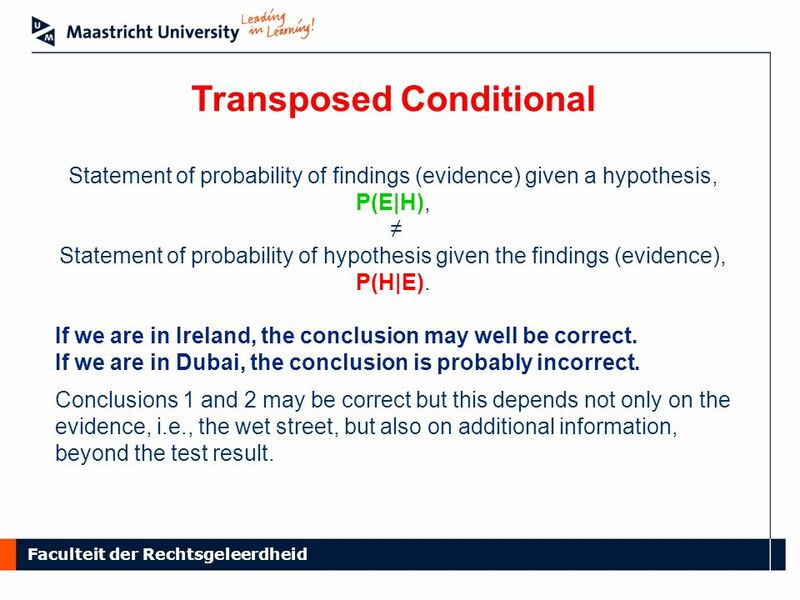 If we are in Dubai, the conclusion is probably incorrect. 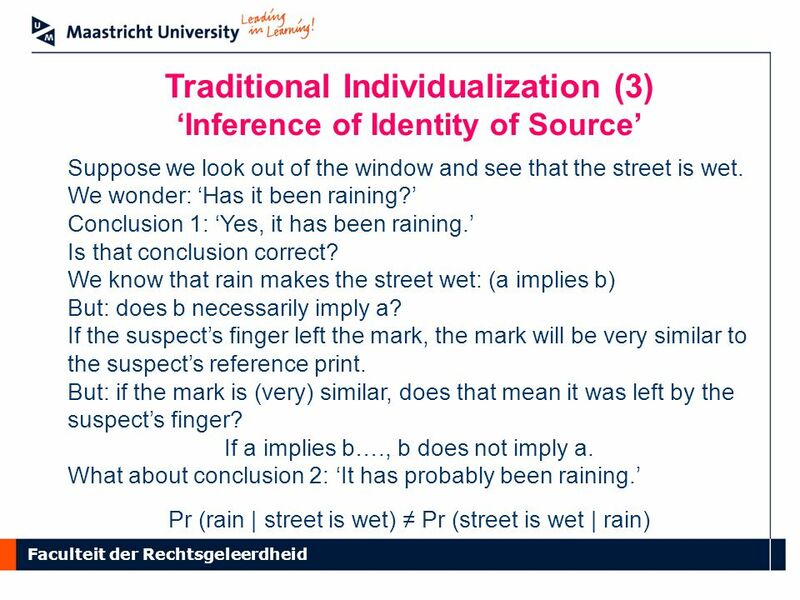 Conclusions 1 and 2 may be correct but this depends not only on the evidence, i.e., the wet street, but also on additional information, beyond the test result. 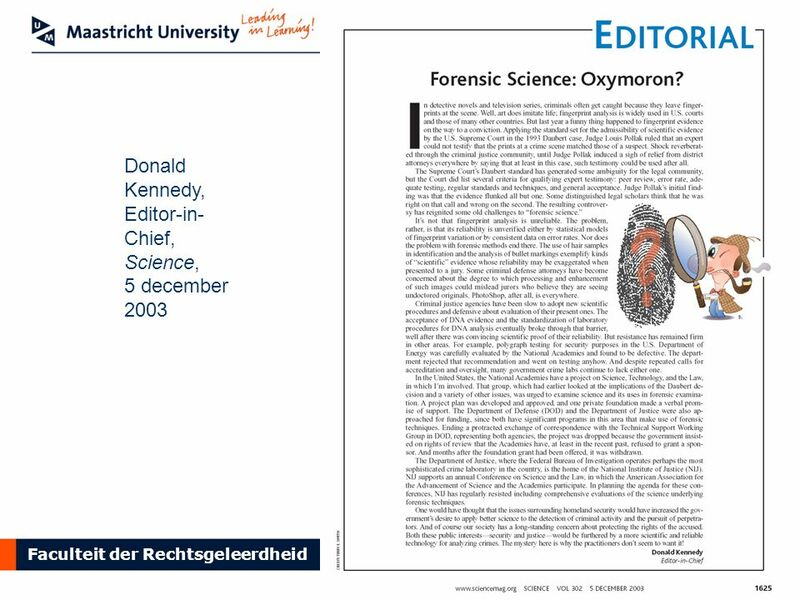 24 Faculteit der Rechtsgeleerdheid DNA – Probabilistic Evidence ‘DNA fingerprinting has  put new demands on the legal profession. 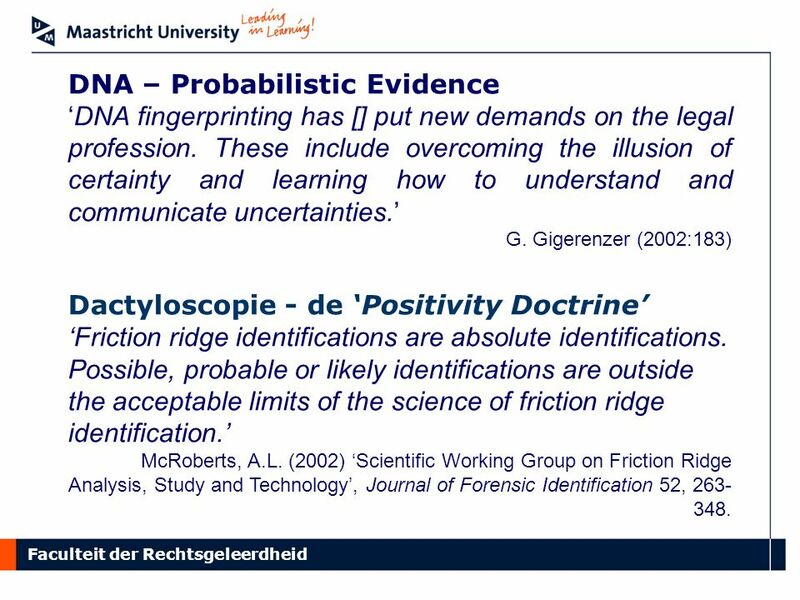 These include overcoming the illusion of certainty and learning how to understand and communicate uncertainties.’ G. Gigerenzer (2002:183) Dactyloscopie - de ‘Positivity Doctrine’ ‘Friction ridge identifications are absolute identifications. 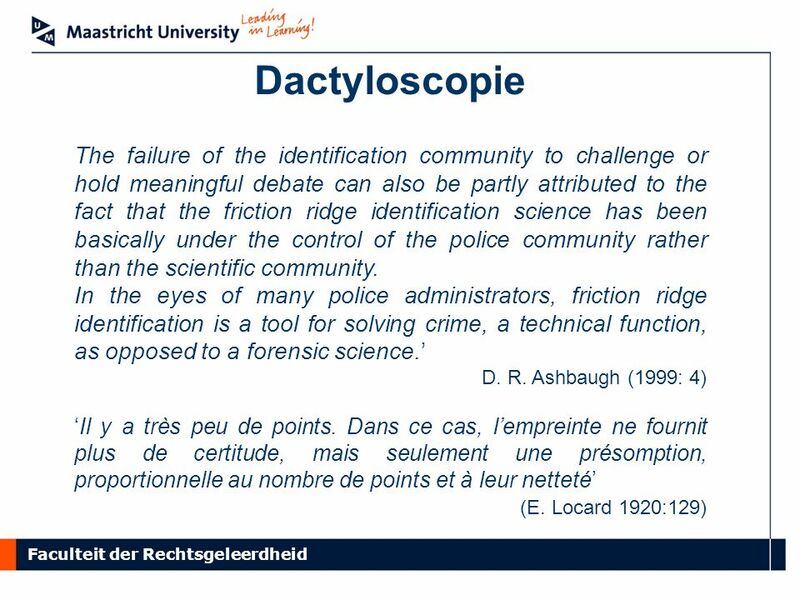 Possible, probable or likely identifications are outside the acceptable limits of the science of friction ridge identification.’ McRoberts, A.L. 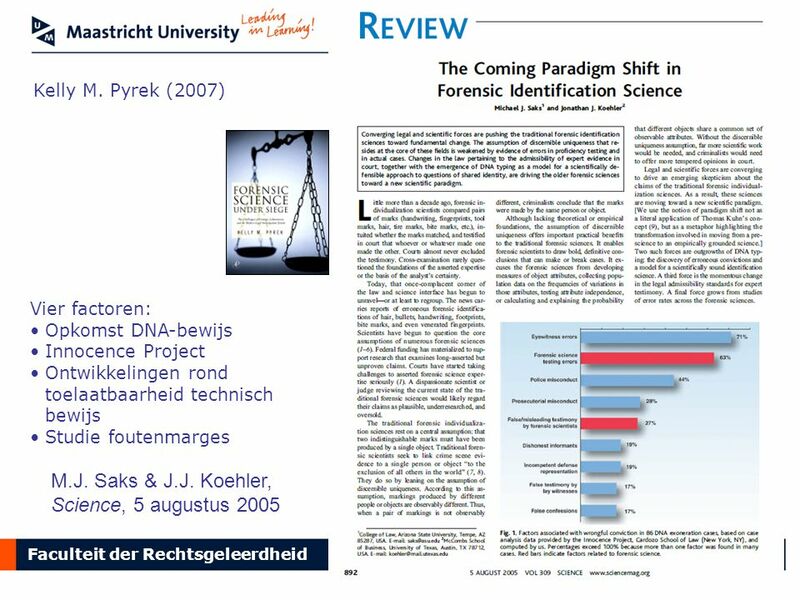 (2002) ‘Scientific Working Group on Friction Ridge Analysis, Study and Technology’, Journal of Forensic Identification 52, 263- 348. 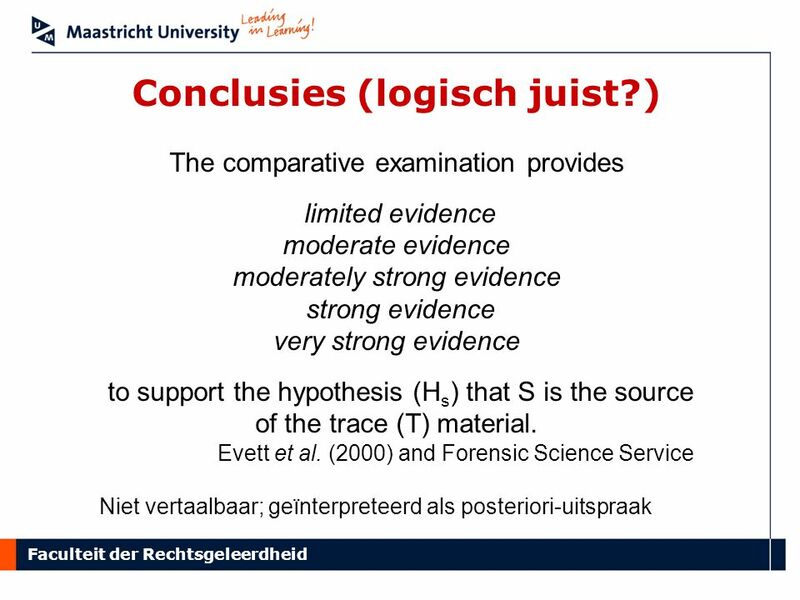 Download ppt "Studium Generale UM 6 oktober 2008 De interpretatie van forensisch-technisch bewijs Ton Broeders Hoogleraar Criminalistiek, Universiteit Leiden & Maastricht." 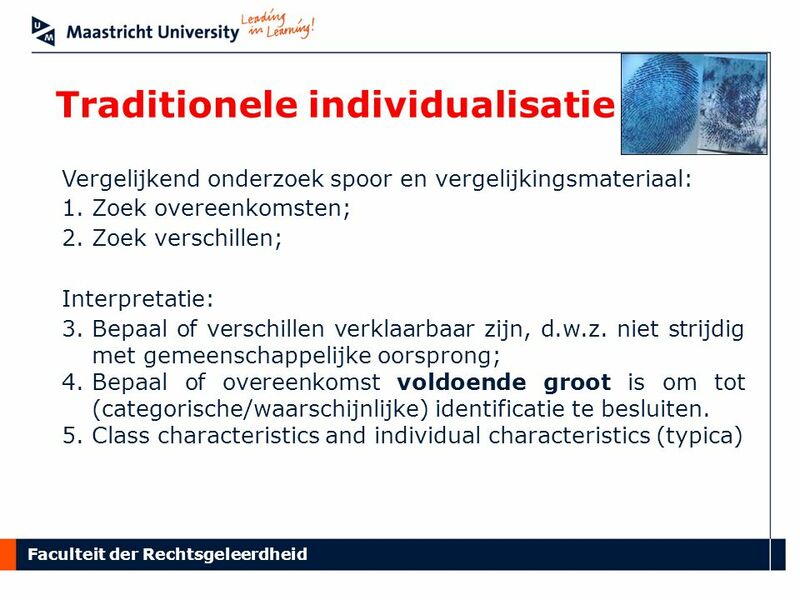 Accessible Instructional Materials. § 300.172. 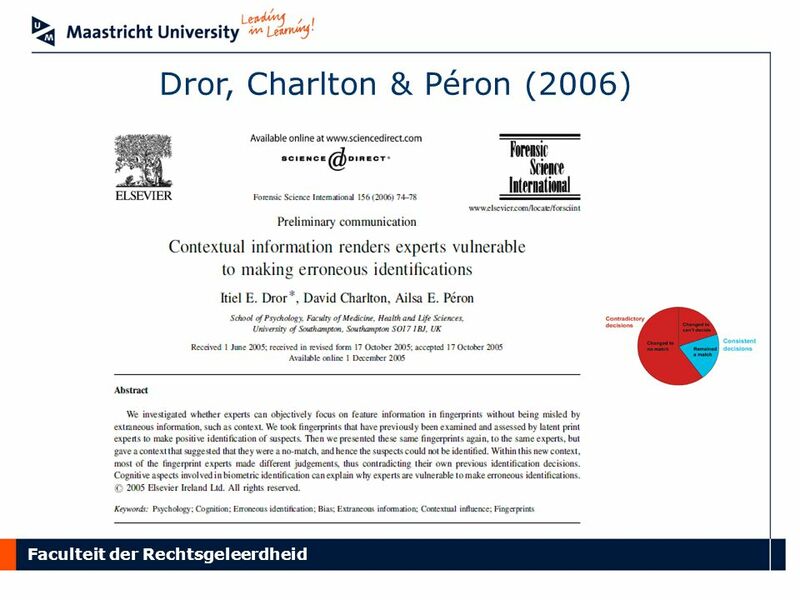 Discussion: Timely access to appropriate and accessible instructional materials is an inherent component.